Infection is a common, natural form of stress, with which the body is regularly challenged. During infection or inflammation, cells of the immune system are responsible for fighting the invading pathogens, leading to high consumption of blood and immune cells. Restoration of the balance of the hematopoietic system following successful elimination of the infection depends on the replacement of lost immune cells by hematopoietic stem cells (HSCs). Until recently, it was thought that HSCs were not directly involved in the defense against infections. However, more recent studies by ourselves and others have indicated that HSCs can directly respond to infections via pro-inflammatory cytokines. 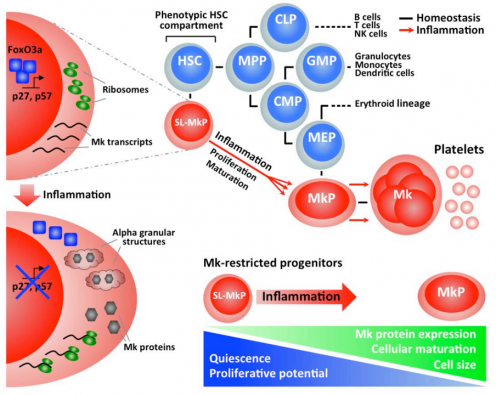 We have demonstrated that the pro-inflammatory cytokine IFNa, which is produced by virally infected immune cells to block the infection of more mature blood cells, can directly activate quiescent HSCs (Essers et al, Nature, 2009), thus indicating that pro-inflammatory cytokines are part of a feedback loop to ensure the re-establishment of the hematopoietic system upon stress induced destruction. In our follow-up studies we could show that IFNa induced activation of HSCs mediates efficient recovery of differentiated blood cells (Haas et al, 2015). We identified the stem-like megakaryocyte-committed progenitor (SL-MkP), which is responsible for driving a rapid maturation program, resulting in efficient platelet recovery after inflammation-induced thrombocytopenia (Haas et al, 2015). Thus, our data revealed an elegant machinery that operates during emergency to counteract life-threatening platelet depletions during acute inflammation. Using single-cell RNAseq and functional analysis, we could further confirm these findings for the human hematopoietic system (Velten et al, 2017). Furthermore, our single cell analysis of the human hematopoietic system also indicated that, during homeostasis, individual HCS gradually acquire lineage biases along multiple directions without passing through discrete hierarchically organized progenitor populations. Instead, unilineage-restricted cells emerge directly from low-primed undifferentiated HSCs and progenitors. These data reveal a continuous landscape of human steady-state haematopoiesis downstream of HSCs and provide a new basis for the understanding of haematopoietic malignancies. In summary, even though we have made important contributions to the understanding of the response of HSCs under stress, many open questions remain on how inflammatory stress impacts on HSCs, controlling emergency hematopoiesis. We are currently investigating the mechanisms leading to increased proliferation, altered differential potential and changes in self-renewal of stress induced HSCs.